This species was named for horticulturist, Barry Yinger of Asiatica Nursery in Pennsylvania after he discovered it in 1984. The species was named in his honor by Dr Samuel B. Jones in 1989. It is native to the islands of Taechuksan and Sohuksan near the southwest coast of Korea. This species forms a small to medium size mound (9 to 19 inches tall) of shiny leaves with thick substance. It has spider shaped, purple flowers with purple anthers. The blossoms are evenly spaced along the scape and appear from August into September followed by viable seeds. 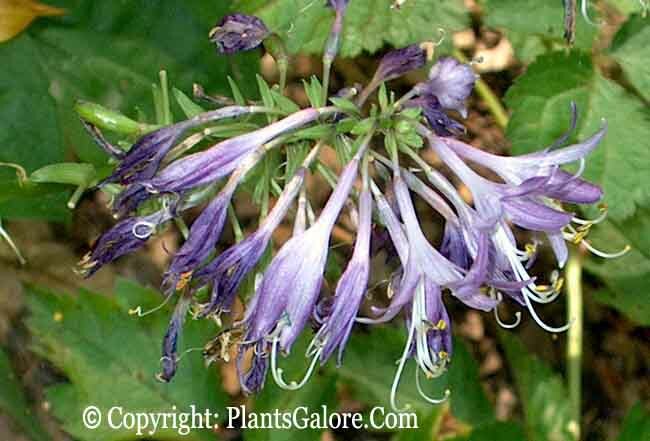 H. yingeri, although a recent discovery, has already been used extensively in hybridizing by Hostaphiles such as Tony Avent, Don Dean, Roy Herold, Greg Johnson, and Bob Solberg. 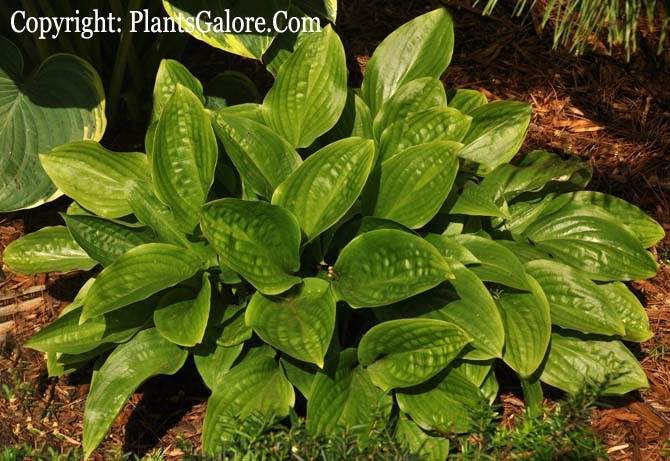 The New Encyclopedia of Hostas by Diana Grenfell (2009) states: "Moderate growth rate...A superb hosta for hybridizing as it passes on its very glossy leaves and spiderlike flowers...Very thick, lustrous leaves..."
Warren I. Pollock in The Hosta Journal (1991 Vol. 22 No. 2) states that, "The flowers of H. yingeri are atypical of most hosta species, having pale purple lobes that spread in a "spider-flower" fashion. Also, the flowers are evenly spaced around the central shaft...Hybridizers are now using H. yingeri to import its good leaf substance, glossiness and unique flower character to seedlings." In The Hosta Journal (1995 Vol. 26 No. 2) Warren I. Pollock states that, "This article is being written in August. H. laevigata is in full bloom and the flowers are among the most beautiful and unusual of any hosta bloom. W. George Schmid named this new species (laevigata means smooth, referring to the leaves)...Visitors to our garden inquire what the hosta's name is, as they also do for a H. yingeri clump which is growing nearby." In an article about hybridizing by Tony Avent in The Hosta Journal (1996 Vol. 27 No. 1), he gives the following comments: "H. 'Potomac Pride' - unique hybrid of H. yingeri x H. 'Blue Cadet' ...a larger plant with spider-like flowers...future parent to many spectacular introductions...Tony also comments on cultivars he has introduced: "...H. 'Outhouse Delight' is our biggest breakthrough, followed by H. 'Elvis Lives'. I am real excited about a coming introduction, H. 'Old Yeller', a cross with H. yingeri and H. 'Sun Power'...pretty incredible...brilliant unique golden color, ruffled leaves, yinger-like flowers...takes full sun...Oh, Baby!" Glenn Herold in The Hosta Journal (2014 Vol. 45 No. 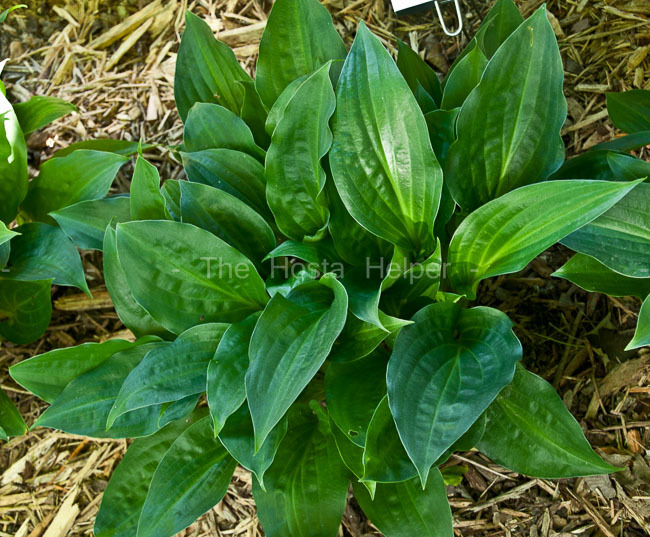 1) states that, "Korea has eight native hosta species: Hosta capitata, H. clausa, H. jonesii, H. laevigata, H. minor, H. tsushimensis, H. venusta and H . yingeri. H. laevigata is closely related to H. yingeri, H. minor is closely related to H. venusta, and H. tsushimensis is closely related to H. jonesii...H. yingeri is found only on the islands of Taehuksan and Sohuksan off the southwest coast of Korea...It was discovered in 1984 by plant collector Barry Yinger...H. yingeri is used extensively in breeding, especially by hybridizers Bob Solberg, Tony Avent, Greg Johnson, Don Dean and Roy Herold...Johnson crossed H. yingeri with 'Sum and Substance' to get 'Old Coot' and 'Jaz'. Both have good substance and shiny leaves. The article also states that, "...As the name laevigata implies, the upper and lower surfaces of the leaves are polished. Also the leaves are longer and narrower and have greater substance than H. yingeri ...also claims the spider flower characteristic, but they are larger than those of H. yingeri ...Unfortunately, H. laevigata is difficult to propagate by seed and hybridize because it does not readily form seed pods. As the name laevigata implies, the upper and lower surfaces of the leaves are polished. Also the leaves are longer and narrower and have greater substance than H. yingeri ...also claims the spider flower characteristic, but they are larger than those of H. yingeri ...Unfortunately, H. laevigata is difficult to propagate by seed and hybridize because it does not readily form seed pods."